A redish-purple sea vegetable native to the North Atlantic, Northwest Pacific and Eastern European oceans that grows in small thick clumps of fronds ranging in length from 1 inch to 6 inches. When dried, it retains its rubbery texture and provides a somewhat pungent, salty flavor. Dulse can be served in salads, soups, and other food dishes, but is often pan fried or baked and then served as an appetizer, snack, or condiment. When preparing it in a dried form, soak the Seaweed for 5 minutes before cooking. In a fresh form, wash the Seaweed to remove excess salt and particles before preparing. In a dried form, it can be kept indefinitely if stored in a sealed or airtight container placed in a dry cool area. Fresh or cooked, it should be stored in a refrigerator. 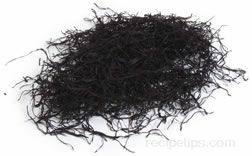 Dulse Seaweed may also be referred to as Sea Parsley.